Abraham Woodhull, Benjamin Tallmadge and Caleb Brewster were friends turned patriot spies from the North Shore of Long Island, whose lives were dramatized in “Turn,” the spring 2014 AMC television series on the Culper Ring. They and other colonists are immortalized today in their families’ preserved homes and re-enacted daily activities for everyone to experience. A visit to the North Shore takes one back to 1778 when Long Islanders lived under an uneasy military occupation by the British commanders and troops. Route 25A, also known as Washington’s Spy Trail and formerly called The King’s Highway, rims picturesque and peaceful Long Island Sound, harbors and inlets. During the American Revolution, these hidden waterways were dangerous spots where the patriots operated boats to row intelligence to Connecticut and to General Washington that helped him win the war. President Washington traveled the route on April 21 to 23, 1790, to thank the patriots and his spies. There are several sites open for the public to learn more about America’s first spies. Raynham Hall in Oyster Bay, briefly served as headquarters for a regiment of 300 British troops called the Queen’s Rangers, and their commander, Lt. Col. John Graves Simcoe, who quartered himself in the house, alongside the Townsend family living there. In 1779, Robert Townsend operated a Manhattan-based merchant shipping firm with his brother William and cousin John. Using his work as a merchant as a cover, Robert could move about the coffee houses, social events, shops and docks of Manhattan, eavesdropping and observing British troop movements, without arousing suspicion. Under the code name “Culper Junior,” Robert Townsend formed the first link in a chain of agents who came to be known as the Culper Spy Ring. Using a special invisible ink formula, invented by John Jay’s brother Sir James Jay, as well as an elaborate numeric code, the spies supplied Washington with critical information about New York City and Long Island. 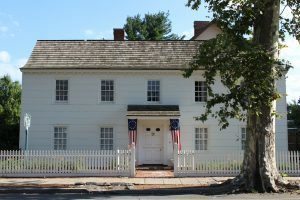 In Huntington, colonial life during the 18th century can be experienced at the “working man’s home” of colonial weaver Job Sammis and his family that from 1775-1776 also served as the arsenal for the Suffo lk County Militia which conducted regular drills on the adjacent Village Green prior to the British occupation of Long Island. During this occupation Nathan Hale volunteered to gather intelligence on the British forces in New York. He began his mission on the shores of Huntington Bay. He was later captured—it is unclear where, perhaps in Huntington or perhaps closer to the city—and hanged in New York City. The Nathan Hale Monument honors his sacrifice and is located on Route 25A, Huntington’s Main St., next to the Sailors & Soldiers Museum. Learn more about Huntington’s fascinating history at the Huntington Historical Society. During the Revolution, Joseph Brewster operated a tavern out of his home, Setauket’s The Brewster House, c. 1665, where he entertained British troops. Caleb Brewster, Joseph’s cousin, delivered spy messages between George Washington in Connecticut, and Abraham Woodhull in Setauket, pulling his rowboat into one of six different coves along the Setauket shore, including one located 150 feet from The Brewster House. 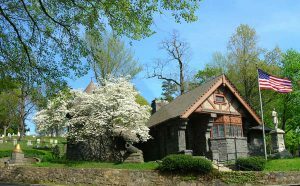 Visit the house today which is owned and operated by the Ward Melville Heritage Organization, Stony Brook. 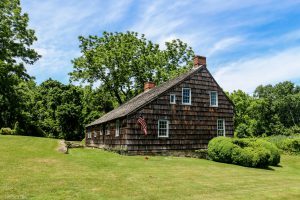 The Brewster House is just one highlight along the trail in Stony Brook/Setauket, birthplace and home to the three friends, and an outpost to the British that they were determined to flush out. Other residents worked with them, including intelligence transmitter Anna Strong, and her husband Judge Selah Strong, who was arrested and incarcerated in the infamous British prison ship, Jersey. Take a walking tour through the original settlement on Main Street, see the Village Green, and visit the churchyard cemetery where Abraham Woodhull and other famous Setauket residents were laid to rest. 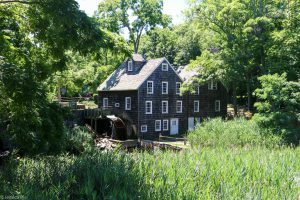 In Stony Brook, be sure to visit the c.1751 Stony Brook Grist Mill. During the Revolutionary War, grains ground at the Stony Brook Grist Mill were taken by the British to feed their soldiers. 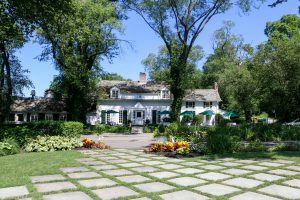 Stay overnight at the c/1751 Three Village Inn in Stony Brook. There you’ll find waterfront cottages and rooms, many named after members of Washington’s spy ring. Find other nearby hotels in the heart of spy country. Also find restaurants where you can stop along your journey.